“Why don’t they make toys like they used to?” “They still do! We offer classic toys, tin wind ups, and hard-to-find retro novelties. Please browse our selection of over 4,000 unique toys and gifts. We ship your order from Atlanta, GA USA. If you place your order before 2PM EST, we will quickly ship your toys today! Thanks to you, our customers, we are now one of the largest tin toy and classic toy stores on the internet! When I was in elementary school, I discovered a treasure: amazing tin toys and playful mechanical machines in my grandfather’s basement. These old clockwork toys have intricate mechanics of levers, cogs, and spring powered actions. As a kid, I somehow felt nostalgic for the style of these retro toy designs. Animated Rockets • These toys were cool! Frequently, my friends wanted to buy these fascinating toys from me, so I saw a business opportunity! I imagined finding these wind-up wonders in shopping arcades around the world and dreamed of having my own store. Through research, I learned that they are still made in Germany, India, China, and Japan. Successfully selling these imported toys at art fairs around Georgia, I expanded my toy business and opened a webstore, TinToyArcade.com. With an ecommerce store I could check my orders from the computer lab and fill the orders after school! Starting with 48 tin toy designs, I gradually added more classic, hard-to-find novelties. I now offer over 4,000 (and counting!) unique toys and fun gifts. Some of our retro toys are available exclusively at TinToyArcade.com. 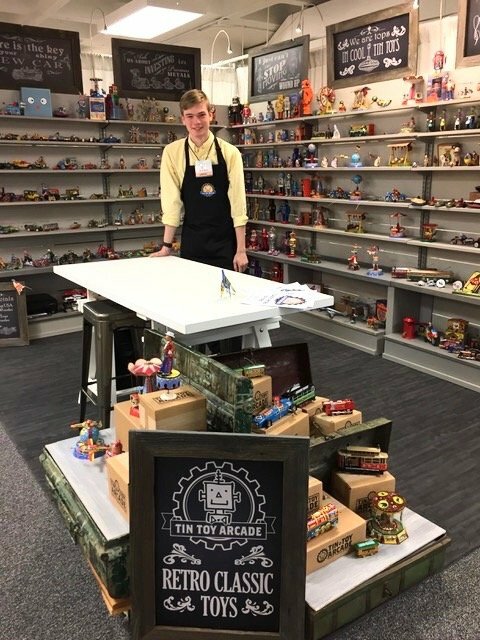 Originally filling orders from my garage, I now employ friends and family to help fill orders from our warehouse near Atlanta, GA. For our exclusive tin toy selection, we also sell wholesale to specialty toy stores and museum shops at America’s Mart in Atlanta and the International Toy Fair in New York. Working to grow my toy business from a small start-up has been an exciting adventure with many fun stories. You may have seen our classic toys on the sets of movies and TV shows: Heroes, Men in Black, The Good Wife, iCarly, The Man in the High Castle, Tomorowland, and Interstellar. We supplied the White House florist with dozens of retro rockets and space toys to decorate an event to celebrate the Apollo space program and the Moon landing. Very cool! 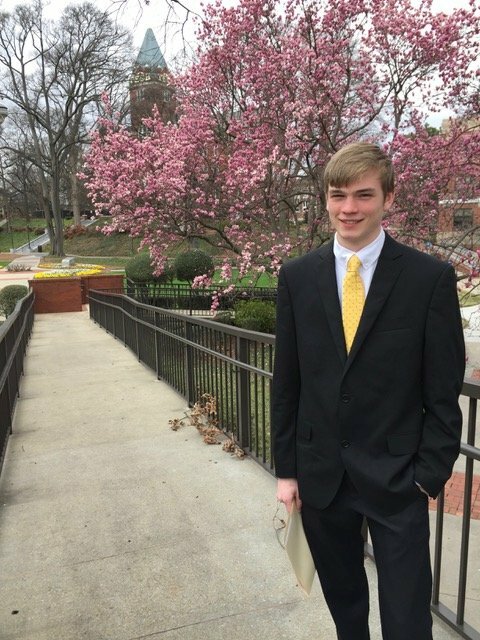 I am now a college student, studying Industrial Engineering and Business Operations. Proceeds from TinToyArcade go toward my college savings and investments in the company.